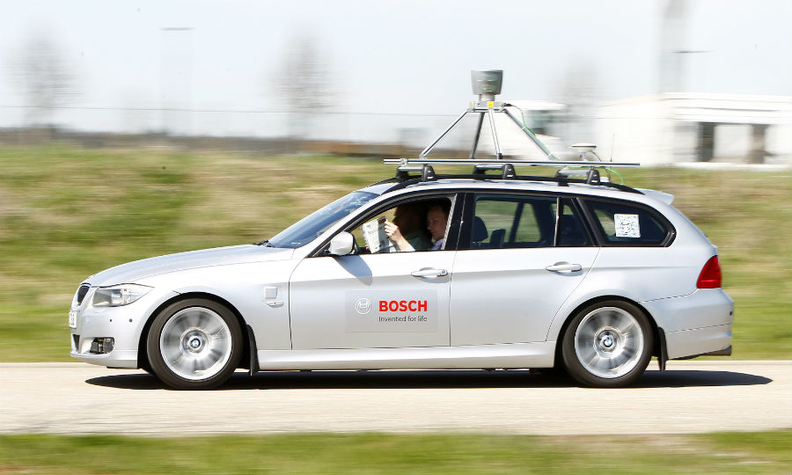 Bosch must maintain a technological edge in areas such as self-driving cars. Here a Bosch autonomous driving development car is seen steering itself while people inside read a newspaper. 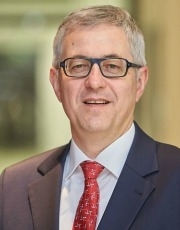 When Rolf Bulander takes over as head of Robert Bosch’s industry-leading car parts division from Wolf-Henning Scheider in April, he will inherit a business enviably positioned at the forefront of auto innovation while gaining authority not afforded to his predecessor. Bosch also is a company increasingly torn between the traditional roots that made it strong and the rapidly developing demands imposed by a digital marketplace. Privately held Bosch hasn’t achieved an 8 percent operating margin, its current target, in more than a decade, but other publicly traded, more cost-driven Tier 1 suppliers such as German rival Continental are more profitable. Continental on Jan. 12 reported that its adjusted earnings before interest and tax margin topped 11 percent last year. In addition, emerging competitors such as Germany’s ZF Friedrichshafen, which is in the process of taking over driver-assistance and safety specialist TRW Automotive, appear poised to chip away at Bosch’s revenue lead. The Stuttgart-based supplier has realized it must adapt its manufacturing-heavy business model to provide more mobility solutions and services. This, however, is a transition that Bosch managers acknowledge will see it encroach further into the territory of its customers, the automakers. Two-thirds of the 46 billion euros Bosch generated in 2013 sales revenue came from its automotive business, where it is a leader in connected cars, fuel efficiency, electromobility and safety. To maintain its technological edge, it outspent the r&d budget of its closest direct competitor, Continental, by more than a 2-to-1 margin in 2013, filing 20 patents on average every working day. Fortune named it one of the world’s most admired companies. Rolf Bulander will run Bosch's auto business from April. Bosch recognizes the need not just to pick up the pace, but to find a more flexible approach using smaller, agile teams that can pinpoint future areas of growth, assess both risks as well as opportunities and exploit their potential. It created the Bosch Start-up GmbH early last year as a kind of skunk works with a mission to bring new products and services to market faster than ever through a more efficient allocation of resources -- even if this means bypassing internal bureaucracy. The unit is a project favored by Volkmar Denner, a trained physicist who has become the embodiment of urgency ever since he took over 31 months ago as only the seventh CEO since Bosch was founded in 1886. Shortly after taking the reins, Denner pushed through the sale of Bosch’s money-losing photovoltaic business, ended a joint venture with Samsung that produced lithium-ion batteries for electric cars and sold a 5 percent stake in Denso that the company had held since the 1950s. To further speed up decision-making, Bosch has decided to alter its management model at its automotive business, in which Scheider was granted titular responsibility. He has served more as the first among three equals that included Bulander and Dirk Hoheisel. While the three-executive format will be kept because of the addition of Markus Heyn to the trio, Bulander will be responsible for Bosch’s auto business in the future. Scheider, who will become CEO at German piston and cylinder maker Mahle, told Automotive News Europe that one thing will not change at Bosch: its conglomerate structure. He said Bosch as a diversified manufacturer now has tremendous opportunity to leverage its expertise in software and micromechanical sensors across businesses that include automotive, home appliances, residential heating and power tools in order to take advantage of a rising trend known as the “Internet of Things” – intelligently networked devices that employ digital connectivity to make everyday life more convenient. “We have always believed that it’s an advantage and now we have the proof. Our video cameras in cars have a common core together with the video cameras in other areas, take security systems for example,” he said. Another example is eCall, the automatic emergency call system for vehicles. Activated by the same sensors that deploy airbags, a car’s infotainment system is used to contact the Bosch security operations center. This development was primarily a cross-collaboration between three different divisions within the company. By rolling out Internet-capable electronic products across its entire range, the company can also offer ancillary services such as software to help ease the hassle of roaming bills when charging an electric car.